In November 2015, all four members of A Tribe Called Quest reunited on The Tonight Show Starring Jimmy Fallon to perform catalogue staple "Can I Kick It?," celebrating the 25th anniversary of their debut, People's Instinctive Travels and the Paths of Rhythm. Four months later, founding member Malik "Phife Dawg" Taylor died of complications from diabetes. After streets were renamed in his memory and reports of a posthumous solo record swirled, Phife Dawg's group mates revealed that they had been at work on one final Tribe album before his passing. 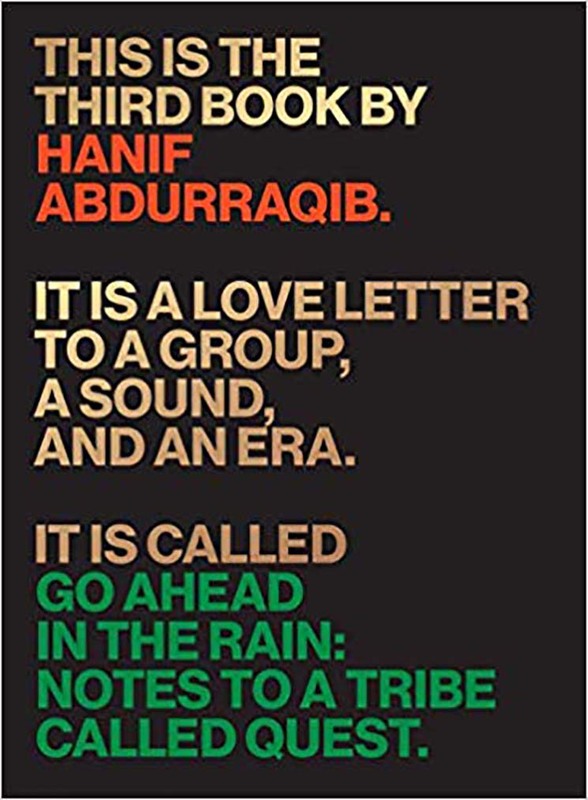 In his book, Go Ahead in the Rain: Notes To A Tribe Called Quest, author Hanif Abdurraqib recalls, of 2016's We Got It from Here… Thank You 4 Your Service: "Earlier that year, I didn't think I wanted another Tribe Called Quest album. Then Phife died, and I wanted another Tribe Called Quest album more than anything. Then it arrived, and it was greater than I could have asked for." He writes of the "everlasting gift" released in the dour days following the United States presidential election. "It's one way to keep a beloved ghost in our ears, no matter what uncertain hell awaits." A poet, essayist and cultural critic, Abdurraqib deftly weaves the biographical, autobiographical and his own elegiac letter writing into just over 200 pages that not only chronicle Tribe's beats and rhymes, but their place and meaning both in his own life and the larger cultural sphere. The result is at once a comprehensive career overview and a riveting personal reflection. The read begins with Abdurraqib outlining the musical traditions that slaves brought to America from Africa, seguing to the preservation of African rhythms, the birth of jazz music and picking up trumpet as a boy in an effort to better connect with his father. These subjects and personal experiences are charted alongside Tribe's career arc in chronological fashion. He frames both alongside cultural moments including (but not limited to) hip-hop's coastal warfare, striking photos published in Jet and The Source, the tenuous relationship between the Grammy Awards and rap music, "mumble rap," and the deaths of Alton Sterling, Philando Castile and Leonard Cohen. Abdurraqib's recounting of the group's creative output remains accessible throughout, digestible for those without a strong command of ATCQ history or that of the genre. Readers learn of Q-Tip's early-career tape-based sampling method, and Phife's apparent reluctance at becoming a full-fledged group member. Elsewhere, Abdurraqib compares the musical one-upmanship of Brian Wilson and the Beatles to that of Tip and Dr. Dre. Abdurraqib splits up the letter writing over three chapters, addressing Q-Tip, Phife Dawg, Ali Shaheed Muhammad and Phife's mother, poet Cheryl Boyce-Taylor. Within these touching entries, his love for the group is laid bare throughout the peaks and valleys of their career. To quote passages at length from these letters here would be a disservice; they demand to be read in full. In a letter to Q-Tip, Abdurraqib is apologetic in recalling the anger he felt in blaming the group leader for Tribe's breakup, in addition to the career and image changes that came with 1999 solo debut Amplified. To the rarely mentioned Muhammad, he recalls the thrill of kissing a girl at a school dance to "Dance Tonight" (a single from the DJ's Lucy Pearl outfit) and how he "let the song rattle around in [his] head for hours, tied to the end of countless possibilities."